I just spent a ridiculous amount of time testing a password protected post in this stupid WordPress app today. WordPress hates me. There, I said it. I had this idea today. 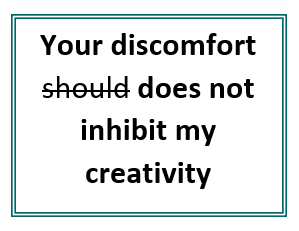 I thought I had found a way to make something work, that would allow a little bit more freedom, a few less barriers, in my writing here on this blog. Since I have other blogs where I publish password protected posts all the time with no issues, I’m a little pissed off it’s not working here. Maybe it’s the theme. Maybe I’ll change the theme. Again. If you follow me via email I apologize for all the non-working links that ended up in your inbox. To calm down I went reading other people’s blogs and ended up in the archives of some. I noticed something prevalent: there are quite a few bloggers who struggle to understand friendships, or any relationship really. But the posts are often vague, hinting at something deeper than one wants to talk about but doesn’t. It’s challenging, sometimes, when you want to say things and you feel like you shouldn’t because we’re all on the internet. But it brings up another point. There are many people in my life who do not come straight out and say it but who show me in their body language that they do not like, or approve of, all this sharing that happens on the internet. Yet, when you look to them for the kind of friendship you may crave, they’re absent, or unavailable, or uninterested, or busy or a number of other, equally valid reasons. So I sit here in my bubble and wonder: if I follow the norm that is my physical friends, who don’t share on the internet the way I do (but quite possibly lurk…) are they still ‘friends’? Because it has occurred to me that I am the one that has to do the reaching out. If I don’t, the so-called physical friendships don’t happen. Just the other day I ran into a friend from the neighbourhood and we briefly talked about getting together for coffee. Did we? I haven’t reached out, mainly due to time constraints here at the moment, but this isn’t the first time I’ve mentioned it to this friend. Having mentioned it multiple times in recent months, why hasn’t a simple coffee date happened yet? Must it be me to set it up? Another friend, also from the hood, whom I bump into occasionally – same kind of scenario. I know instinctively that if I were to send a text out right now, they both would say yes (after consulting calendars and kids schedules and all the rest of it). But why does it have to be me? It makes me wonder if we’re all loners, or introverts. Or maybe just not as socially inclined as some others. I see friendship as a two-way street; why is it up to only one person to maintain the relationship? Then there’s us, the bloggers, the writers. We get frustrated when we can’t empty our heads, so to speak. So we turn to blogs. Like me and my endless drivel that often makes up my own blog. Drivel that feels ‘dealt with’ when I hit publish. And, if I’m brutally honest, validated at the likes and comments that come back. Especially comments. You seem to get me in a way that a lot of people in my life don’t. I am this way, too. I also worry to pursue neighbors or new acquaintances because perhaps their non-reciprocation is a sign they don’t really want to be friends? Therein lies the social anxiety. Some people are watchers, whilst others live the drama and play our blogging parts. I believe virtual-blogging relationships are deeper than most “real world” ones, people grow less emotive and unable to communicate as time passes, this virtual feel-sharing shall become the new normal soon enough. Interesting perspective. I guess being a lurker implies you’re a consumer, but not a contributor…but there isn’t anything wrong with that. I used to lurk on many blogs. Now I tend to lurk less. But to each his or her own. Yes….to all of it! Including family relationships. I did a “test” yrs ago. I didn’t start out with a friend or a cousin, it was with my parents. I stopped going over there & calling…..to see how long it would take for them to be the one to reach out. 8yrs. It took 8yrs for them to wonder why I wasn’t coming over or calling. It’s now been about 10yrs since the end of that 8. Things are better, but that’s another story. I’m truly content with just my husband, kids, & grandkids. Aw, thank you! It took me a long time to feel more comfortable, but the community I managed to find here has done so much for me personally. And creatively, too. I’ve had the same experiences as you – I have forged far closer friendships with people on the internet than I have in real life. Everybody claims to be so busy all the time – but when you pick apart the various TV shows they claim to have watched, the books they say they have read, and the movies they have seen, you suddenly realise that the time WAS there – they just chose to use it differently than you. Anyway. I’m rambling. I’ll shut up. Over the years, I’ve had many blogs. Some I shared a lot on, some not so much. It’s never people in my daily life who understand it. My internet blogging friends, however, totally get it. I enjoy your blog. It’s real life. I often wonder whether there’s people I know lurking in the shadows and reading my blog? I am sure of it. I have a few lurkers myself. 😀 I prefer not to know, then if I ever meet them I won’t have to worry. aw, screw em if they don’t like or approve of something. sometimes we worry more about other people than we do about ourselves.